Magic Duels proves it is possible to be both a good game and rather unimpressive at the same time. The annual release of Wizards of the Coast's Duels of the Planeswalkers has undergone some cosmetic changes, but at its heart, it is still the Magic: The Gathering game that we've come to know and love. Unless you haven't come to love Magic: The Gathering. If you've never played the card battle game that put card battle games on the map, you'll probably just find Magic Duels to be like Hearthstone: Heroes of Warcraft without all the charm and soul. It's clear Wizards of the Coast hasn't been blind to the success of Blizzard's card game. Hearthstone took the collectible card world by storm with all the style and underlying comedy of a Blizzard game combined with all the underlying strategy of a good card game. Paired with an excellent free-to-play model that didn't make you feel you had to spend money to compete, a relatively simple selection of gameplay modes and the ability to quickly go online and challenge other players, it's easy to see how Hearthstone has become one of the most popular card games these days. Hearthstone players will notice many similarities between the games. They both feature "story" modes where you play against a succession of villains to complete the story, they both allow you to duel against the AI to sharpen your skills and duel against other players to show your prowess, they both have daily quests to help you gather gold, and -- of course! -- they both center on letting you build your own strategy through custom decks. And yet, Hearthstone just seems to do most of these things better. The game board you play on is better in Hearthstone, with cards that are easy to see. The cards in Magic Duels can be hard to see even when playing on a full-sized iPad. The tutorial is quick, easy, comprehensive and even fun in Hearthstone, whereas the tutorial in Magic Duels can be like pulling teeth, especially if you are familiar with card games. Even the process of opening packs of new cards seems more magical in Hearthstone. And the process of building a deck is much, much better in Blizzard's game. So if Magic Duels is so bad, how does it get four stars? A good question with a good answer. As a card game, Hearthstone if fun and has its own level of difficulty and strategy. But Magic: The Gathering is intense. It set the standard to which all card games are judged, and it is still the best overall card game for those who love building cool decks with unusual tactics and then rampaging opponents. To quote Spinal Tap, Magic: The Gathering takes it to eleven. 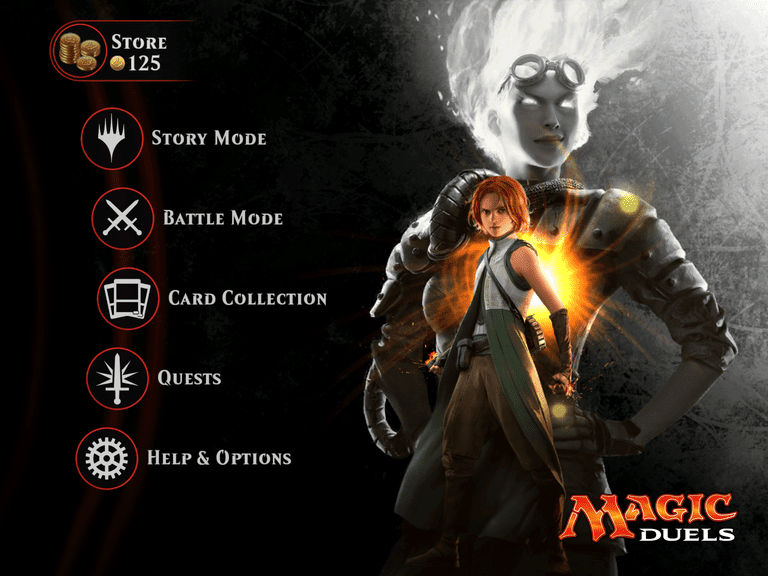 And Magic Duels is the best iOS rendition of the game. It has clearly taken a lot from Hearthstone, and that's a good thing. It doesn't have the same charm and humor as Blizzard's game, but it really doesn't need the bells and whistles. It has the cards and the decades of balancing and innovation to create a solid game. If you are a fan of Magic: The Gathering, you'll like Magic Duels. The free-to-play model has definitely taken from Hearthstone, and that's a good thing. You won't feel like you absolutely have to buy booster packs. You'll simply want to. The game has daily quests, solo battles against the AI to check out your deck, casual and ranked multiplayer and the 'Two-Headed Giant', a 2v2 game of Magic: The Gathering. One thing the game is missing is something similar to The Arena, which was both a great distraction in Hearthstone and a great way to collect more gold and cards. Hopefully, they'll add something similar to it as the game goes along. And while the deck-building screen doesn't have the simplicity of Hearthstone's deck building, Magic: The Gathering is a much more complex game. The ability to mix and match from any set of cards means the process of building a deck is going to be more complex. This edition of the game includes a Deck Wizard, which should help newbies get started with the process, and at the very least, teach them the valuable lesson of balancing the deck. You can download Magic Duels from the App Store for free.